If some studies fail to show a link between mobile phone use and cancer, doesn’t that mean the technology is safe? Aren’t we exposed to more radiation from the sun on an airplane journey than from any of this wireless technology? Is radiation the same as radioactivity? Haven’t we all been exposed to radiation from radar and radio broadcasting antennae for many years without health damage? Why aren't our health protection agencies getting involved? Why don't official regulations protect us? Isn’t it the government’s job to protect the public against health risks? Why don't we hear about this risk from the media? Why don't cancer charities warn us about this risk? Wouldn’t doctors have stopped using mobile phones if they were dangerous? I have read literature which says this radiation is safe and that campaign groups are scare-mongering. There seem to be scientists saying it is fine, so why should I be worried? Other than children, which people might be more vulnerable than the general public? What is the SAR rating of a mobile phone? Surely tiny levels of radiation from digital baby monitors, mobile and cordless phones on standby and wi-fi networks can't be a problem? I would like to reduce exposure but I need the technology for my work. Doesn’t the increased safety children get from having a mobile phone out-weigh their possible health risks? Do interactive whiteboards in schools cause concern? What about other sources of radiation from outside the home and school, such as mobile phone masts and power lines? You can not see, feel or hear electro-magnetic fields, apart from visible light, which is a part of the electro-magnetic spectrum. Microwaves (microwave radiation) are also part of the electro-magnetic spectrum. We have evolved with the natural levels of EMFs produced by both the sun and the natural environment around us but their effects differ from EMF's on other parts of the spectrum, including microwaves. Microwave frequency exposure is a very recent phenomenon. At the start of the 20th century the background radiation was millions of times lower than it is now, and it is as recent as the mobile phone boom of the 1990s that the modern, digitally pulsed signals have become commonplace. With sunlight we know that our bodies have a certain amount of natural protection in our skin to minimize the damage, but with more and more exposure our skin becomes damaged and we can get skin cancer. Science is unclear whether our bodies have any natural protection against electro-magnetic radiation and at exactly what levels our bodies are vulnerable to damage, though it is probable that each of us is different. Electrosmog is the invisible pollution or "smog" in the form of EMFs from the now widespread microwave-emitting devices such as mobile phones, their masts, wireless routers and DECT phones. Just as 'normal' smog is the pollution from car exhausts that causes breathing problems and other health problems, electrosmog is the equivalent pollution from our wireless age. A study with negative results (no association) does not balance out one with positive results (showing an association). We don't have to be sure that the technology ALWAYS causes damage; we need to be concerned if it SOMETIMES causes damage. It may cause damage only after sufficient exposure, or after a latency period; it may cause damage to some people and not others. It is only by looking at all the studies together that we can form a picture of whether health concerns have some justification. It is no consolation to a parent that their child may not be affected, if there is a chance that their child will be affected. There is every prospect that the studies that fail to show a link may simply be studying the particular people who are not affected, or the people who are not affected YET. Many of the negative studies didn't include long-term users so the people studied might have gone on to develop cancers. We will have a clearer picture as more studies are carried out but, in the meantime, children need to be protected from the possible dangers. Radiation is a general term for the emission of energy. Radioactivity is a special form of radiation that is emitted when the nucleus of a radioactive atom disintegrates. It can include sub-atomic particles such as alpha and beta particles as well as gamma rays (a form of electromagnetic radiation). It is called ionizing radiation because it has enough energy to break chemical bonds and can damage molecules in living tissues. It can break DNA molecules and make holes in cell membranes, which results in further DNA damage as digestive enzymes stored in lysosomes (membrane-bound particle that recycle waste) are released inside its cells. Electromagneticradiation is transmitted in the form of electromagnetic waves that travel at the speed of light. It includes light itself, the colour of which depends on its wavelength and gives rise to its spectrum from violet to red (the colours of the rainbow) with the longest wavelengths at the red end. Shorter wavelengths include ultra-violet light, X-rays and gamma rays. These shorter wavelengths are also forms of ionizing radiation that can damage living cells by breaking chemical bonds. Although not widely publicised studies have been carried out in proximity to TV and Radio antennae as well as RADAR facilities with conclusions that leukaemia rates, cancer rates and mortality rates are significantly higher than in areas further away from these facilities. So it does seem that some health damage is occurring with RADAR and radio antennae too. The Health Protection Agency (HPA) says that “the balance of evidence to date suggests that exposures to …radiation below … guidelines do not cause adverse health effects to the general population”. We think this fails to give any sense of the amount of evidence of adverse health effects. The research so far is limited and many of the health problems that might be associated with this form of radiation take 10-20 years to manifest, so scientists have not been able to properly study the long-term effects yet. Additionally, many scientists believe that mixing in short term and light users with the long term and heavy users has diluted the results in some studies and gives the appearance that there is no link. Where studies have separated out the heavy longer term users there has been shown to be a much higher incidence of certain brain tumours in these people. There is every chance that studies in future years will show that this correlation is much higher amongst those who consistently use mobile phones for 20 years or more. The chairman of the HPA, Sir William Stewart stated in an article in The Times newspaper in 2006 that that evidence of potentially harmful effects of microwave radiation had become more persuasive over the past five years. So far the HPA has not revised it's advice, nor is it raising the alarm publically. These values were set in 1998 well before most of the studies indicated adverse biological effects at exposures below these levels. The limits are set to protect against the heating (thermal) effects of the radiation but not the non-thermal (biological) effects. Biological effects are changes to the body other than heating up of body tissue . Many studies have found that the type of radiation emitted from mobile phones and wireless technologies have biological effects and the exposure limits do not prohibit radiation emissions at such levels. We saw with smoking and asbestos that governments do not always work swiftly nor take a precautionary approach when it comes to long-term health risks. 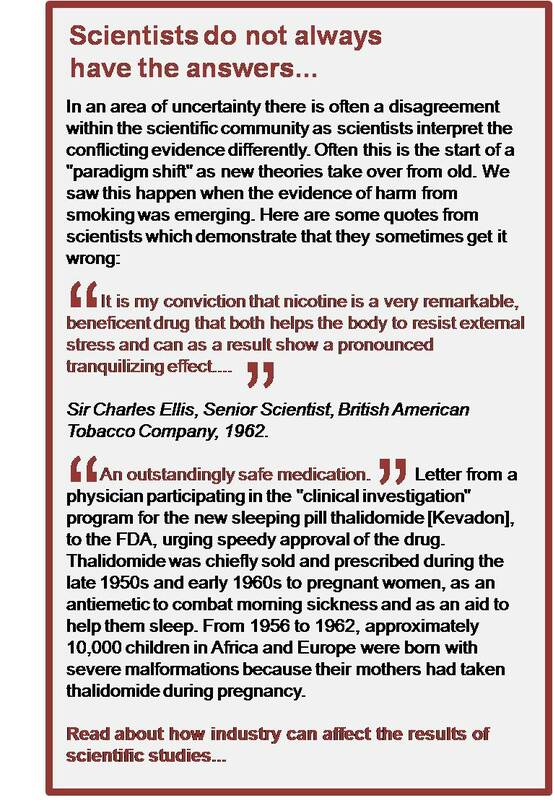 It took about 100 years from the early signs of smoking health effects for governments to bring in health warnings and restrictions on purchase by children. Governments have a number of competing responsibilities which can conflict with their health protection role. Mobile communications represent a huge source of economic success and tax revenue. In 2001 the UK government made £22 billion from the sell-off of 3G mobile phone licences alone and it continues to sell off more parts of the electromagnetic spectrum; it receives annual tax revenues of approximately £15 billion from the mobile phone industry and further amounts from wireless telecoms. The government pays lip service to the precautionary principle but does not appear to be giving it priority. The department of health’s leaflet "Mobile Phones and health” states that children under 16 should only use mobile phones for short essential calls but the leaflet has not been seen by most children or parents. Given the possible economic costs of raising concerns about the safety any product, governments tend to wait until the evidence is irrefutable. They want proof "beyond a reasonable doubt, whereas parents concerned about children's health mostly want to know if there is a chance of a risk even if it isn't entirely proven, especially if the risk could have a very big impact on health. 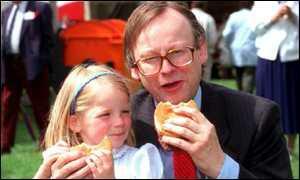 The UK government was criticised for this approach when it insisted that BSE was not a health risk: the then minister responsible went on TV saying he would give his daughter a beef burger. Later it was widely agreed that the government’s advice was precipitous and it had put its wish to avoid the economic effects of a public panic before public protection. There are many other examples where governments have delayed in raising the alarm. It could take another 20 years or more to know for sure whether mobile phones and wireless technology are safe or unsafe. We believe that where health effects could be serious, the responsible approach where there is any material risk of damage is to warn the public so they can make informed choices. If lives are at stake governments should not wait until the risk of damage has been proven beyond doubt, but should raise the alarm once all the information available indicates that serious damage is possible so the public can make informed choices. Some cancer charities, for example Cancer Active, have recognised the link between mobile phone use and cancer. We are surprised that Cancer Research UK has not recognised the association and we are particularly surprised by the statement on its website that "scientific evidence so far shows that using mobile phones doesn't increase your risk of any type of cancer". Apart from the fact that many studies have shown an association between mobile phone risk and cancer, the statement that a study shows there is no risk is unsupportable: no evidence of harm is not the same as evidence of no harm. At most, a study could indicate that no risk has yet shown up. While some, mostly industry-funded, studies have shown this, many studies have shown that risks increase significantly after ten years or more use of a mobile phone. The Cancer Research UK website refers only to one (heavily criticised) study not to the many other studies on this subject, a number of which are more up-to-date. Cancer Research UK receives significant funding from corporate sources. Take a look at these adverts from the 1950’s and decide whether you think doctors always know all the facts about risks to health. Doctors are busy professionals who are dependent on advice from government and professional bodies. These do not always highlight the full range of scientific opinion or, particularly, a lack of scientific certainty. We have formed our opinion based on the scientific evidence. This website has been created entirely by volunteers and we have no vested interests. The same cannot be said of all commentators on the subject, many of whom recieve funding directly or indirectly from the telecommunications industry or are connected in other ways to telecoms corporates. Far from scare-mongering, we hope to help the public to make informed choices based on an full understanding of the science. We believe that the UK's health protection agencies are failing in their duty to bring the possible risks to the public's attention to enable them to use the technology more safely. This may save lives. Pregnant women, the elderly, those who are sick, convalescing or have impaired immune systems. The SAR rating of a mobile phone is the Specific Absorption Rate of the energy produced and is used as a measure of the absorption of radio waves in the head. It is a relatively inaccurate guide to the radiation level emitted by a particular phone. While using a phone with the lowest possible SAR value is preferable, doing so will have little effect on exposure compared with other strategies because the ratings are an inaccurate guide to relative exposures. Measurements in test situations do not necessarily accurately reflect the differences in head tissue type and age of the exposed person, which can greatly affect absorption in practice. The SAR is affected by how you hold your fingers on the back of the phone in order to press the phone to your ear - especially in phones with internal antennas. The SAR is measured with the handset operating at full power, so does not reflect how a phone responds to low signal strength which can significantly affect the level of radiation emitted by a particular phone. Using a speaker phone or headset reduces exposure to the head much more effectively than switching to a low SAR value phone. A comparative guide to radiation emitted from mobile phones has been issued by US watchdog the Environmental Working Group (EWG). As with sunlight where people have different skin types and can tolerate more or less tanning, so people have different tolerance to microwaves. Some people become consciously sensitive to particular electro-magnetic fields. For children this is typically a particular symptom related to a particular source, such as a headache while using a mobile phone, or “flu-type” symptoms and headaches a few weeks after joining a school with WiFi when they have not been exposed to such radiation in their previous school. A small number of people develop electro-hyper-sensitivity (EHS). Their sensitivity to electro-magnetic fields becomes no longer limited to one type of exposure but is suddenly extended to a wider range of electro-magnetic fields. In addition they often suffer a wider range of symptoms. The trigger for the stage can be sudden (such as the installation of a wifi router or a portable DECT phone in the home, or the erection of a phone mast outside a house, or having a MRI scan) or cumulative (such as many years’ heavy use of a mobile phone). EHS is thought to be irreversible; the only effective palliative measures are (a) avoidance of electro-magnetic radiation or (b) shielding from electro-magnetic radiation. Both of these protective measures are becoming increasingly difficult in the growing o-smog” in modern society. EHS is technically not an illness but rather a functional impairment or disability. The Canadian Human Rights Commission has recognised EHS as an environmental sensitivity which should be accommodated. Studies have shown objective physiological changes amongst those who report symptoms of EHS. Are tiny levels of radiation from digital baby monitors, mobile and cordless phones on standby and wi-fi networks really a problem? This is an area where research is very limited. The concern relates to the potential impact of long-term cumulative exposure, particularly during children's formative years, while their bodies are developing, and combined exposure from many different radiation sources. Many children are being exposed to radiation day and night from a number of sources at once. There may well be one or more mobile phone masts near their home, maybe a digital baby monitor close to their cot, a cordless phone and a wi-fi enabled computer in the home. When they go to school there will probably be another mast nearby and maybe similar cordless and wi-fi equipment at school. They are also exposed to radiation from mobile and cordless phones being used around them at home, at school and in public places. They experience this throughout their childhood, and in their teens they may carry and use a mobile phone themselves and a cordless phone at home. Many will use their mobile phone and cordless phone for long periods, sometimes 1-2 hours a day held next to the head and when on standby close to the body. Microwave radiation only occurs at negligible levels naturally so children’s exposure is literally millions of times higher than their bodies have evolved to deal with. By the time they are in their 20’s their cumulative exposure will be exponentially higher than we would have experienced at the same age. Each person's situation is different and each of us has to work out our own balance between the convenience of wireless products and reducing the risks. While focusing on the children don't ignore your own exposure entirely. Children need parents!